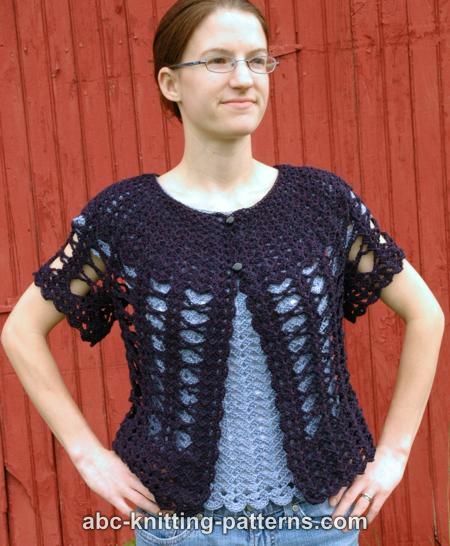 The cardigan is worked top-down in rows back and forth without seams. 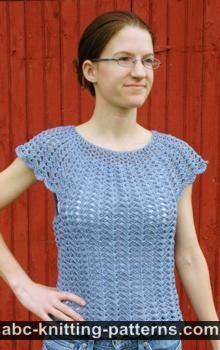 Sleeves are worked in rounds. Row 1 (WS): V-st into the 5th st from the hook, *skip 1 , V-st in the next ch, repeat from * to the end of the round, there should be 37 (43) V-st, end with 1 dc into the last st. Rows 2-3: ch 3, *V-st into ch 1 of the V-stitch of the prev. row, repeat from * to the end of the row, end with 1 dc. Row 4: ch 3, *Shell (see above) into the ch-1 of the prev row V-st., repeat from * to the end of the row, end with 1 dc. Rows 5-6: ch 3, *Shell (see above) into the ch-1 of the prev row Shell, repeat from * to the end of the row, end with 1 dc. Row 7: ch 3, *Shell2 (see above) into the ch-1 of the prev row Shell, repeat from * to the end of the row, end with 1 dc. Row 8: ch 3, *Shell2 (see above) into the ch-2 of the prev row Shell2, repeat from * to the end of the row, end with 1 dc. Row 9: ch 3, *Triple Shell (see above) into the ch-2 of the prev row Shell2, repeat from * to the end of the row, end with 1 dc. Row 10 (RS): ch 3, *Triple Shell (see above) into the ch-2 of the prev row Triple Shell, repeat from * to the end of the row, end with 1 dc. Row 11: ch 3, Triple Shell, *ch 7, skip Triple Shell, Triple Shell into next Triple Shell, repeat from * to the end of the row, end with 1 dc. Row 12: ch 3, Triple Shell, *ch 3, 1 sc under ch 7, ch 3, Triple Shell into next Triple Shell, repeat from * to the end of the row, end with 1 dc. Row 13: ch 3, Triple Shell, *ch 7, Triple Shell into next Triple Shell, repeat from * to the end of the row, end with 1 dc. You now have 19 (23) Triple Shells columns with chains between them. Place markers on the 4th, 8th, 12th and 16th (5th, 9th, 15th and 19th) Triple Shell columns. That will mark the fronts, back and sleeves. Row 14: same as row 12, but at first (4th [5th] column) and last (16th [19th] column) markers work (3 dc, ch 2, 3 dc, ch 2, 3 dc) instead of Triple Shell. 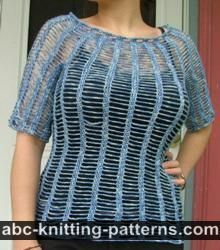 The Round yoke is now divided for back, fronts and 2 sleeves. Cut the yarn. 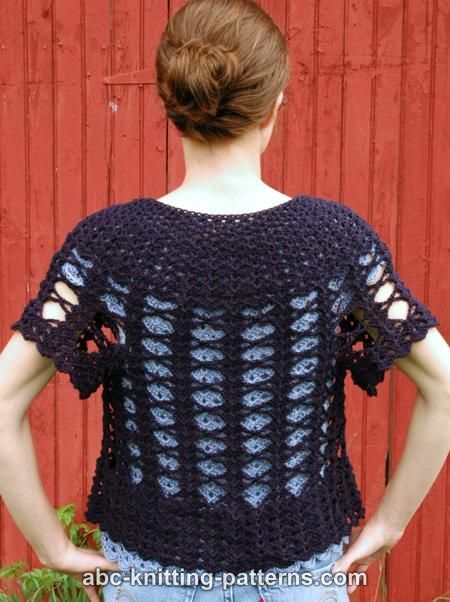 Attach the yarn at the 2nd marked colum (8th [9th]) and work 2 rows of Triple Shell as established over ONLY back stitches, back and forth. In the last row, at marked columns, work (3 dc, ch 2, 3 dc, ch 2, 3 dc) instead of Triple Shell. Cut the yarn. Secure the yarn at the beginning of the wrong-side row. Row 15: ch 3, (Triple Shell, ch 7) 3 (4) times, Triple Shell into the 1st ch-2 of the double Triple Shell of the marked column, ch 19 (underarm), skip 3 sleeve shells, Triple Shell into the 2nd ch-3 of the double Triple Shell of the next marked column, (ch 7, Triple Shell) 4 (6) times, last Triple Shell into the 1st ch-2 of the double Triple Shell of the marked column, ch 19 (underarm), slip 3 sleeve shells, Triple Shell into the 2nd ch-2 of the double Triple Shell of the last marked column, (ch 7, Triple Shell) 3 (4) times, 1 dc. 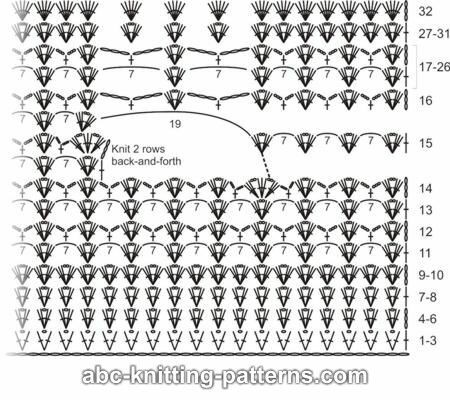 Row 16: ch 3, *Triple Shell, ch 3, 1 sc under ch-7, ch 3, repeat from * to the end of the row, end with Triple Shell, 1 dc. At the underarm work Triple Shell at the 10th ch of ch-19. 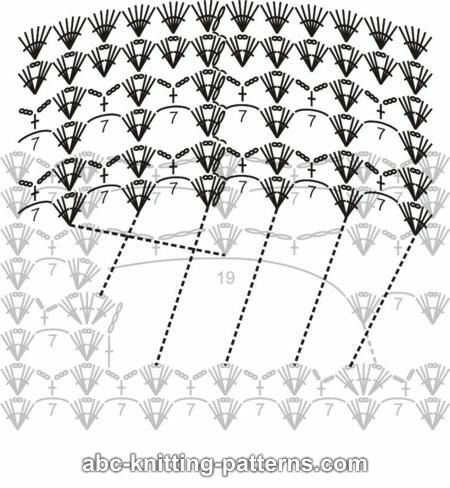 Row 17: ch 3, *Triple Shell, ch 7, repeat from * to the end of the row, end with Triple Shell, 1 dc. 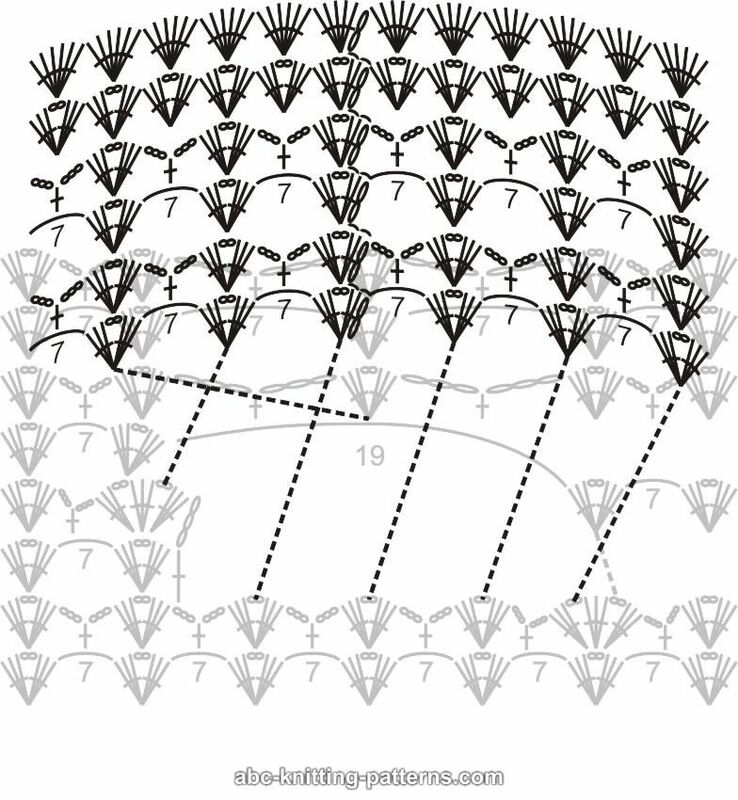 Row 18: ch 3, *Triple Shell, ch 3, 1 sc under ch-7, ch 3, repeat from * to the end of the row, end with Triple Shell, 1 dc. Rows 19-26: repeat rows 17-18. 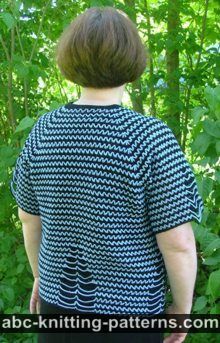 For size L work 2 more rows or to desired length. Row 27: ch 3, *Triple Shell into the next Triple Shell, Triple Shell into 1 sc, repeat from * to the end of the row, end with Triple Shell, 1 dc. 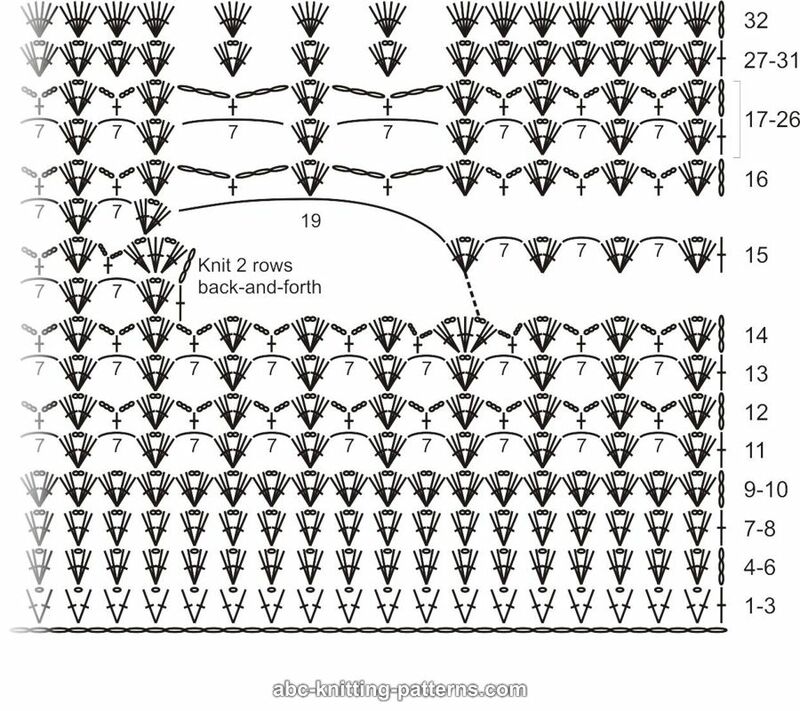 Rows 28-32: ch 3, *Triple Shell, repeat from * to the end of the row, end with 1 dc. Tie off. Start at the center of the underarm. 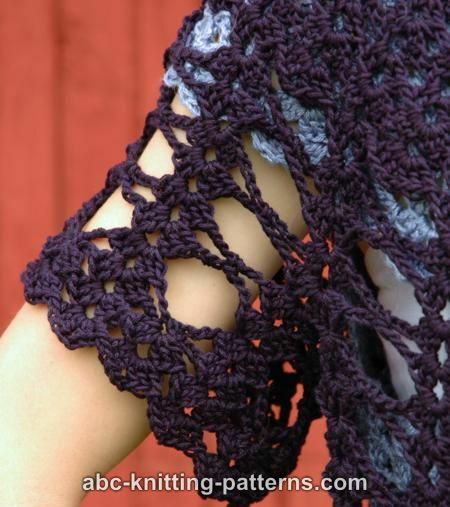 Secure the yarn to the center ch of the underarm, where Triple Shell is worked. Round 1: [ch 2 (counts as 1 dc), 2 dc, ch 2, 3 dc] in the same ch the Triple Shell of the bodice was worked, *ch 7, Triple Shell, from * repeat 6 times, ch 7, sl st to ch 2. sl st to ch 2, sl to next dc, sl st to next dc, sl st to ch 2. When working Triple Shells in the marked columns, work it in the other ch-2 spaces. Round 2: [ch 2 (counts as 1 dc), 2 dc, ch 2, 3 dc] in the Triple Shell, *ch 3, 1 sc under ch-7, ch 3, Triple Shell, from * repeat 6 times, ch 3, 1 sc under ch-7, ch 3, sl st to ch 2. sl st to ch 2, sl to next dc, sl st to next dc, sl st to ch 2. Round 5: [ch 2 (counts as 1 dc), 2 dc, ch 2, 3 dc] in the Triple Shell, *Triple Shell into 1 sc, Triple Shell into next Triple Shell, from * repeat to the end of the round, Triple Shell, sl st to ch 2, sl to next dc, sl st to next dc, sl st to ch 2. Round 6: [ch 2 (counts as 1 dc), 2 dc, ch 2, 3 dc] in the Triple Shell, * Triple Shell into next Triple Shell, from * repeat to the end of the round, sl st to ch 2. Tie off. 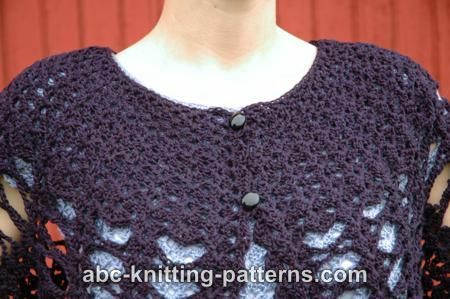 Starting from the bottom of the right front, work 1 row of Shell2s along the center front, then work sc along the neckline and again Shell2s along the center of the left front. Sew on 2 buttons at the top of the button bands. 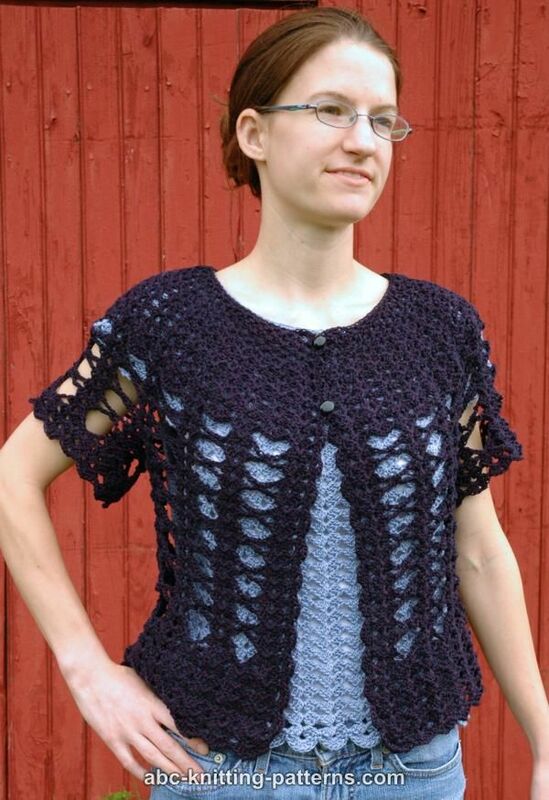 Is there a knit version?